Trump has called the effort "sad." The presidential election was called for Donald Trump one month ago, but that has not stopped potential recounts in four states that experts say will likely not change the outcome of the election. Green Party presidential candidate Jill Stein is leading the efforts in three states, while a third-party candidate has filed a recount request in the fourth state. Democratic presidential nominee Hillary Clinton's team has said it would join the recount effort, which President-elect Trump has called "sad." Stein’s campaign has cited the analysis of outside experts who suggest that the vote count could have been tampered with. There has been no evidence of foul play in any state, and no proof has emerged of tampering during the recounts so far. Recount requests have now been received in all three states that Stein had listed on her fundraising website as goals -- Wisconsin, Pennsylvania and Michigan. Another state -- Nevada -- received a recount petition from Roque 'Rocky' De La Fuente, who ran as part of the American Delta Party. 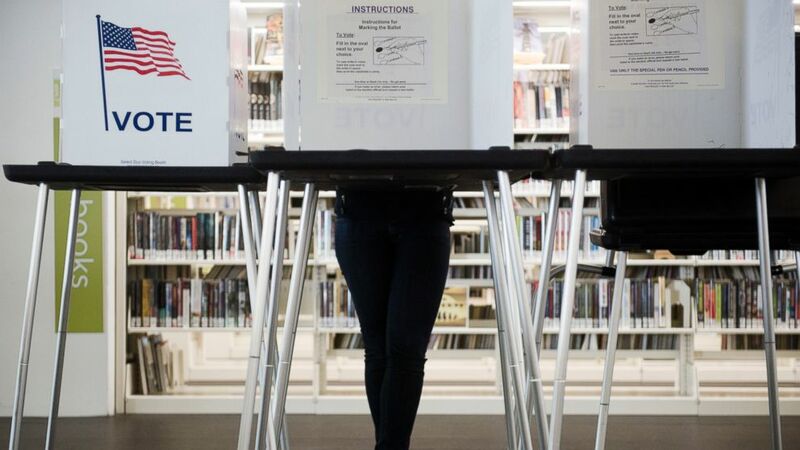 Two of the states in question -- Wisconsin and Pennsylvania -- have already begun required audits of their elections, which is done by checking the results of a random sample of voting machines to make sure the technology actually works. (LAUREN JUSTICE/The New York Times/Redux) Early voting underway at the Central Library in Madison, Wisconsin, Oct. 14, 2016. A federal court invalidated much of Wisconsin's restrictive elections law, concluding in July that it discriminated against minorities. But the state's response to a court-imposed remedy has been somewhere between lackadaisical and defiant. Stein filed a petition to hold a recount and subsequently sent a wire transfer of $3,499,689 to state election officials, which the Wisconsin Elections Commission confirmed that it had received on Nov. 29. Officials said the total cost may be closer to $3,898,340 after discovering an error in their original calculations. The recount started Dec. 1 and needs to be completed by Dec. 13, which officials have already warned may be a tight turnaround. “It will be a significant challenge to complete a statewide recount of nearly three million votes in less than two weeks,” the elections commission memo read. The recount is going to be done by both hand and machines, depending on the county. The commission denied Stein's request for the entire recount to be done by hand because it does not have the authority to give such an order, Reid Magney, the commission's public information officer, told ABC News. Forty-eight of the state's 72 counties will be completing the recount by hand, while 14 counties plan to use optical scanners and 10 counties plan to use a combination of optical scanners and hand counts, though those numbers may change, Magney said. Trump’s win in Wisconsin was one of a series of surprises on election night; the Badger State had not voted for a Republican president since the 1984 election. According to the Wisconsin Elections Commission, a total of 2,975,313 votes were cast in the state, and Trump beat Clinton by more than 27,000. Stein had 31,006 votes in the state. Michigan Secretary of State Ruth Johnson confirmed that a recount request from Stein was received and said in a statement on Nov. 30 that county clerks "have been gearing up to complete this recount under a very challenging deadline." Johnson expressed bewilderment at Stein's efforts. "It is unusual that a candidate who received just 1 percent of the vote is seeking a recount, especially when there is no evidence of hacking or fraud, or even a credible allegation of any tampering. The cost of this recount to Michigan taxpayers could easily reach into the millions of dollars. Based on Wisconsin’s estimate, Michigan taxpayers could be paying $4 million despite the $1 million the Green Party nominee must pay to have the recount," she said. The recount process in Michigan was immediately halted Dec. 1, however, after the state's Bureau of Elections "received an objection from representatives of Donald J. Trump." In a statement, the bureau -- without explicitly stating where it is in the recount process -- said that "Under Michigan law, the recount is halted when the Board of State Canvassers resolves the objection." The bureau's board met on Dec. 2 and rejected Trump's objection. A federal judge then ordered that the recount re-start on Dec. 5. However, the recount was halted again on Dec. 7 by the same judge following a state court ruling that found that Stein had no legal standing to request another look at ballots, according to The Associated Press. A spokesman for the Michigan Secretary of State's office told ABC News on Dec. 8 that in the wake of the hearing, the recount is "completely over." "The courts have ruled that Jill Stein’s recount should stop. This is a testament of the integrity of Michigan elections. I especially want to thank our local clerks and their staff, precinct workers, county clerks, our staff at the Michigan Bureau of Elections and especially the patriots who volunteered their personal time to ensure integrity at the polls and in the partial recount efforts that have taken place. We live in the greatest nation in the world and are resilient, and at our best when we work together," the statement from their office reads. Trump was declared the winner in Michigan by The AP on Nov. 28 and the state's board of canvassers certified the election the same day. Pennsylvania Secretary of State spokeswoman Wanda Murren told ABC News that the Green Party has filed a lawsuit on behalf of over 100 registered voters asking for a recount, which Murren noted is technically called a statewide election contest under the state's guidelines. Stein submitted an affidavit by a computer scientist, who raised the possibility of a cyberattack. Similar to what happened in Michigan, the Trump campaign filed court papers in Pennsylvania opposing Stein’s case. “She has to prove that the election was illegal in some way. A judge will decide if a recount will happen,” Murren said of Stein. On Dec. 5, Stein filed a separate lawsuit against Pedro Cortes, Pennsylvania secretary of the commonwealth, and Jonathan Marks, commissioner of the Bureau of Commissions, Elections and Legislation, asking for a statewide recount. In addition, Murren said that between 200 and 300 petitions for precinct recounts have been filed, but an unknown number of them were duplicates or submitted after the deadline, so it remains unclear how many of the state’s 9,163 precincts could potentially have contests. De La Fuente, the American Delta Party candidate, requested a recount in Nevada. Gail Anderson, the spokeswoman for the Nevada secretary of state's office, announced the results of a sampling of select precincts in five counties on Dec. 8. In the five counties, there was a "net nine-vote decrease" for Clinton, a six-vote decrease for Trump and no change for De La Fuente, according to a news release from the Nevada Secretary of State. State law mandates that if there is more than a 1 percent change in the vote counts for those counties, a statewide recount is required. But because that benchmark was not reached in this case, "a full statewide recount of the presidential election results will not be conducted," the release stated. According to ABC News’ analysis of the vote, Clinton won Nevada by 26,434 votes out of the more than 1.1 million votes cast in the state and if the partial recount finds a 1 percent discrepancy for either Clinton or De La Fuente, who came in last in the state, then a recount will be ordered in all 17 Nevada counties. Why are they asking for recounts? According to Stein's statement announcing the first recount filing in Wisconsin, "the three states were recommended for scrutiny by election integrity experts and advocates because of the vulnerability of their voting systems and various indicators of concern -- including unexplained high numbers of undervotes." Stein's campaign manager David Cobb said in the statement that "the recount was not filed in order to change the election outcome, which is unlikely, nor to favor any one candidate. We are pursuing this recount to verify the integrity of the election result." Will the outcome of the election change because of the recount? It's impossible to say for certain, but no one involved in the recount efforts so far has said that Trump's presidential rival Clinton could emerge victorious. "I fully expect, given the history of how elections are conducted in Wisconsin ... that the outcome is not going to be different" than the current unofficial results, Mark Thomsen, chair of the Wisconsin Elections Commission, said at a news conference on Nov. 28. Stein held a rally in front of Trump Tower in Manhattan on Dec. 5 and made it clear that she isn't expecting the overall outcome to change, saying that it would be “unfair” to “raise expectations that the outcome is going to change.” She also emphasized she isn’t doing this in support of one candidate. “This is not about challenging one candidate or assisting another candidate. This is about ensuring that all votes are counted and that voters can trust the system," Stein said. More than $7 million has been raised for the legal and recount costs, according to Stein's official fundraising recount site. The money will go toward funding recounts in Wisconsin, Pennsylvania and Michigan. On Nov. 28, a member of Stein's press team said that money came from more than 137,000 donors and the average donation has been $45. If there are any excess funds, Stein's press team said the campaign will consult with the Federal Election Commission guidelines on how best to proceed. According to the fundraising page set up by Stein, she and her team expected the filing fee in Wisconsin to cost $1.1 million -- less than a third of what Wisconsin elections officials estimated -- along with $600,000 in Michigan and $500,000 in Pennsylvania. Attorney fees are expected to cost millions of dollars more. The money raised will also pay for the recruitment of recount observers. Stein has made it clear that the money will only be used for the recount campaigns. "We are raising money into a dedicated account for a recount campaign. The money cannot be used for anything else. It cannot be used for my campaign. It cannot be used for the Green Party. It can only be used for the recount," Stein said during an interview on ABC's "The View." Trump tweeted that the recount was a “scam” on behalf of the Green Party and used a portion of Clinton’s concession speech in which she said the election results must be accepted in an effort to diminish the efforts. According to Marc Elias from the Clinton campaign's legal team, they will follow Stein's lead in participating in the recount process. Elias said that the Clinton team takes concerns over potential hacking or altering of results "extremely seriously" but also made it clear that they were not the ones who started this process. “We are getting attacked for participating in a recount that we didn't ask for by the man who won election but thinks there was massive fraud,” Elias tweeted on Nov. 27. On. Nov. 27, Trump made what many say is a baseless claim that “millions of people” voted illegally, and “I won the popular vote if you deduct” those allegedly fraudulent votes. Kay Stimson, spokeswoman for the National Association of Secretaries of State, told ABC News that the organization has "no information that can help to explain what sources or information are behind the basis of the tweets," referring to Trump's comments about the "millions" of illegal votes and alleged fraud in Virginia, California and New Hampshire. On the state level, California Secretary of State Alex Padilla released a statement slamming Trump. "It appears that Mr. Trump is troubled by the fact that a growing majority of Americans did not vote for him. His unsubstantiated allegations of voter fraud in California and elsewhere are absurd. His reckless tweets are inappropriate and unbecoming of a President-elect," Padilla said in the statement. Federal law mandates that any recounts need to be completed 35 days after the election, or by Dec. 13. The electors who make up the votes in the Electoral College are slated to meet in their respective states on Dec. 19 and then send their decisions to Washington. The National Archives states that the electoral votes need to be received by the president of the Senate, who is Vice President Joe Biden, and the archivist by Dec. 28. ABC News' Lauren Pearle and Josh Haskell contributed to this report.